Last April, a community apiary home to seven honey bee hives and 150,000 honeybees opened on NC State’s Centennial Campus. Bee Downtown, a Triangle-based company that installs and maintains beehives on corporate campuses to help rebuild healthy honey bee populations, launched the Centennial Campus apiary. Founder and CEO Leigh-Kathryn Bonner is a third-generation NC State alumna and fourth-generation beekeeper. Coming from a long line of North Carolina farmers, hosting the apiary on campus bridges her passion for both beekeeping and the university. Bonner was recently named an Inc. 30 Under 30 Most Inspiring Young Entrepreneur, as Bee Downtown grew existing partnerships across North Carolina and expanded its footprint into Atlanta this year. Celebrating new partnerships with companies like AT&T, Chick-fil-A, Cox Enterprises, Delta Air Lines and more, the company continues to hire new beekeepers and key employees to keep up with the rising demand. Bonner credits NC State and its entrepreneurship programs in Bee Downtown’s continued growth. “It’s one of the best, if not arguably the best, in the country. The staff really invest in and care for the students, not just while they are in school, but once they’ve graduated as well. NC State faculty and staff don’t just help students with their ideas; they work to cultivate them — they nourish the idea, spending the time needed to make sure it grows and thrives,” said Bonner. Bandwidth believes in what Bee Downtown is doing to help grow the bee population. We’re invested in our Bandwidth bees — we have teams that go out and help maintain the hives alongside Bee Downtown’s beekeepers. The Centennial Campus Partnership Office worked to secure the campus location for the apiary and hive sponsors, including lead sponsor Bandwidth, a communications technology company based on Centennial Campus, along with AndyAlbright.com, Freudenberg IT, the student-led SOUL Garden, NC State’s Institute for Nonprofits and NC State Entrepreneurship. According to Bonner, NC State’s focus on sustainability is one of the reasons the apiary has been so successful. “The landscaping is wonderful. The apiary is located right next to Lake Raleigh with pollinator gardens nearby and natural space surrounding the hives.” The location is convenient for students, faculty, staff and campus employees to walk through during a break. “There are not many opportunities in our world today to slow down and be in the moment — the apiary allows folks to enjoy being outside while learning about the environment around them,” said Dictus. What’s next for the Centennial Campus apiary? Bonner says she would like to see more events that help people learn about the bees and the sponsors supporting them. “When we think about the future, it leads us to ask ourselves a bunch of questions: How do we get more people out there? When is the best time to engage the community? How do we help people answer questions about bees during times when there is no beekeeper there? How do we help more people help the bees?” The apiary is located on Main Campus Drive between the Hunt Library and Lake Raleigh — stop by and meet the bees the next time you’re near campus. Building on the ecosystem started by Bee Downtown’s apiary, Centennial Campus is now home to new bee hotels, providing a vital habitat for North Carolina’s native bees. 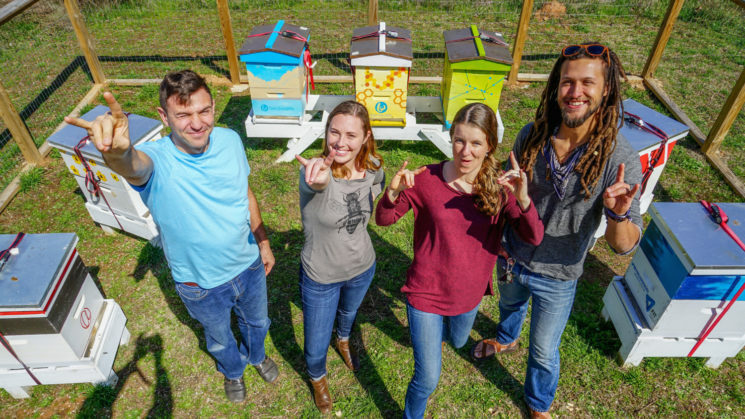 Jonathan Giacomini, an NC State Ph.D. student in Applied Ecology, and Sara June Giacomini, a research technician for a campus research lab, received a grant from NC State’s Sustainability Fund to install the bee hotels. Bees on Centennial Campus also benefit from several pollinator-friendly gardens, which students and faculty have created to boost the health and effectiveness of pollinators. To learn more about Bee Downtown, visit bee-downtown.com or follow them on Instagram, Facebook or Twitter: @beedowntown. This post was originally published in Centennial Campus.